Proteomics has come a long way from the initial qualitative analysis of proteins present in a given sample to the large-scale characterization of proteomes, their interactions and dynamic behaviour in time and space. Originally enabled by breakthroughs in protein separation and visualization (by two-dimensional gels electrophoresis) and protein identification (by mass spectrometry), the discipline now encompasses a large body of protein and peptide separation, labelling, detection and sequencing tools supported by stable-isotope- and label-free techniques and computational data processing for quantitative proteomics. The key functional importance to investigate the protein complement has driven the study of proteomes in numerous physiological and pathological conditions. Proteomics has been mainly applied in discovering novel biomarkers of disease, evidenced by the fact that most clinical tests today measure proteins in blood. Moreover, understanding the proteome helps investigate health and disease states and understand the mechanisms of action of specific molecules, e.g., nutrients or drugs. Here, we briefly recapitulate proteomic technologies and cover their evolution to today’s and future cutting-edge platforms. 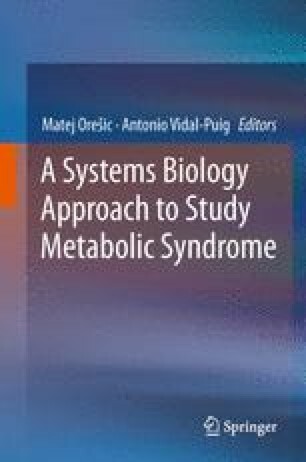 Then we review and discuss proteomic applications to the study of the metabolic syndrome.